This description of the seven bowl judgments indicates that they will transpire late in the end times as these plagues are the “last” and will finish God’s (thumos) wrath. First (Revelation 16:2): Sores shall appear on those who have the Mark of the Beast & worship his image. Second (Revelation 16:3): Every living soul in the sea will die & the sea will become like blood. Third (Revelation 16:4-7): Rivers and fountains of water will turn into blood. Fourth (Revelation 16:8-9): The sun will scorch men with extreme heat. Fifth (Revelation 16:10-11): The kingdom of the Antichrist will be full of darkness, and people will experience severe pain. Sixth (Revelation 16:12-16): The Euphrates River will dry up. Leaders and armies across the world will assemble at Armageddon. Seventh (Revelation 16:17-21): Babylon the Great will be destroyed, the greatest earthquake of all time, the wicked destroyed by plagues. I equate the bowl judgments to the plagues of Egypt described in the Book of Exodus. Pharaoh was given many opportunities to repent while plagues wreaked havoc on his kingdom. He refused to repent, so he and his kingdom suffered severe consequences. Meanwhile, God protected those who were not the target of those plagues, especially when the firstborn of Egypt were appointed to die (Exodus 11:4-7). Revelation 14 tells us that an angel will call on people to repent before the start of the bowl judgments. Like Pharaoh, the people who will be harmed by the bowl judgments will refuse to repent. Eventually, God will destroy the wicked with the seventh bowl judgment (Revelation 16:17-21). It’s important to recognize that not everyone alive at that time will have the Mark of the Beast. Therefore, there will be some survivors who will have quite interesting stories to tell. 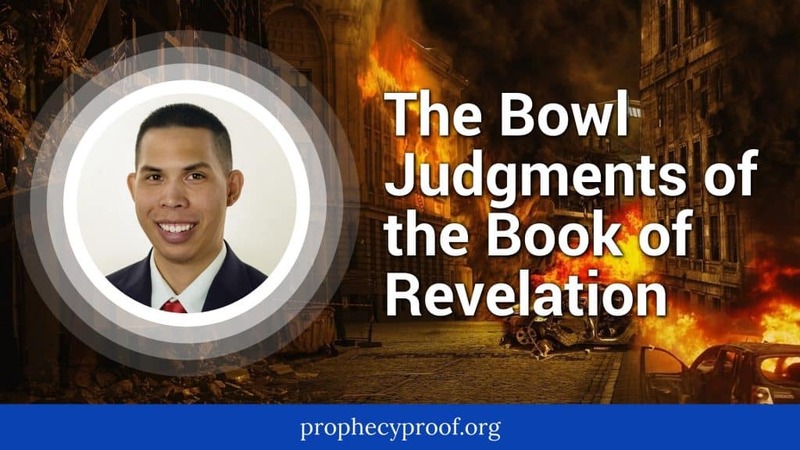 You can learn more about the bowl judgments and other end time events in my comprehensive end time book Prophecy Proof Insights of the End Times. Thumos and orge are the main words used for “wrath” in the New Testament. Thumos in an end time context is the wrath that God will exhibit against the wicked as they refuse to respond to efforts encouraging them to repent. Meanwhile, orge is God’s longstanding wrath against the wicked, who He will punish with lasting consequences. Do the bowl judgments occur at the end of the great tribulation or after at Christ’s second coming? They start before the end of the great tribulation and before Christ’s second coming. Please explain why Jesus appeared and made a declaration in the midst of the gathering of armies in preparation for the Armageddon. What is the relevance of His appearance for this particlar event? Is He addressing this to those had the mark of the beast or to those whom He really appeared for? Does “Behold” mean, “here am I, look at me”? I left Revelation 16:15 out intentionally because that may be the subject of its own article. Like Luke 17:37, Revelation 16:15 is one of the most overlooked verses in all Bible prophecy. I am a Postribber, the 6th Bowl Judgement is my timing of the Rapture, not the 7th Trumpet Jedgement. Some Post-Tribbers have timelines where the 6th bowl and 7th trumpet happen in near proximity to each other.